Breanna M. Caldwell is an associate in Eastman & Smith’s Business Law Practice Group. She joined Eastman & Smith after successfully completing the Firm’s summer associate program in 2016 and graduating from the University of Michigan Law School in 2017. As a summer associate, Ms. Caldwell gained experience drafting commercial contracts, forming entities and researching various business law issues. As an associate, Ms. Caldwell continues to expand upon that experience. 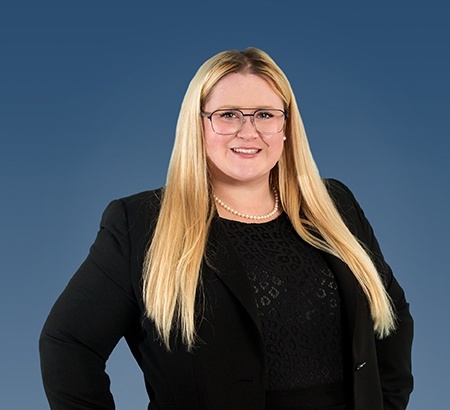 In addition to drafting commercial contracts, forming entities and researching various business law issues, Ms. Caldwell advises clients on mergers and acquisitions, all aspects of commercial transactions and general business law. During her tenure at the University of Michigan Law School, Ms. Caldwell gained insight into what it takes to zealously represent clients on a wide range of matters with a focus on dotting all I’s and crossing all T’s on the front end, so that litigation can be avoided on the backend. She gained this insight while serving two years as a student attorney with the Michigan Innocence Clinic, where she conducted legal research and drafted briefs in state and federal courts, including the United States Court of Appeals for the Sixth Circuit. For her zealous representation of clients as a student attorney, the University of Michigan honored Ms. Caldwell with its Craig Spangenberg Oral Advocacy Award. In addition to working in the Clinic, Ms. Caldwell served as an editor of the Michigan Journal of Race & Law and worked as a student teacher with the University of Michigan Department of Sociology while in law school. Prior to law school, Ms. Caldwell worked for two years as a corps member with Teach For America. Before joining Teach For America, she graduated with distinction from Indiana University (Bloomington) with a triple major in Philosophy, Criminal Justice, and Communication and Culture.